"This apple butter is good." 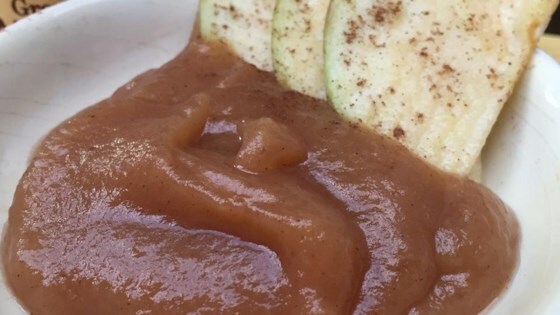 Stir apples, sugar, apple cider, cinnamon, allspice, salt, and cloves together in a slow cooker. Cook on High for 1 hour. Reduce heat to Low and continue cooking, stirring occasionally, until the mixture is thickened and dark brown, 9 to 11 hours. Remove cover and continue cooking on Low, whisking occasionally, until desired smoothness is achieved, about 1 hour. Sterilize the jars and lids in boiling water for at least 5 minutes. Pack the apple butter into the hot, sterilized jars, filling the jars to within 1/4 inch of the top. Run a knife or a thin spatula around the insides of the jars after they have been filled to remove any air bubbles. Wipe the rims of the jars with a moist paper towel to remove any food residue. Top with lids, and screw on rings. Halved the sugar. The allspice and clove threw us off a bit, but the end result was nice!